Just when you think there might not be a solution, there are custom removable decals. deSIGNery’s custom removable and temporary decals are known to be used on fragile merchandise due to their ease of use and hassle free removal. Some of these merchandise may include, TVs, stereos, MP3 players, reading and sun glasses, glass sculptures, picture frames, and many more. Although removable decals are great on these products, they are also well known for their universal use. Personalized removable decals can be used on vehicles, doors, windows, shelf markings, and walls. Check out our Spring Sale for savings on Custom Printed Removable Stickers and Removable Decals in the following link. BBB Member since 2004 with a proven record of complaint free customer satisfaction on items like Custom Printed Removable Stickers. Click on the BBB logo above to check our record or leave a customer review. If you are in the market for Removable Decals, give us a call today and you will soon realize why after 24 years we still have an A+ BBB rating! At deSIGNerySigns.com we have more than 24 years experience in designs for our Removable Decals. Call us today and let our design specialists help create your next project to promote your product or business. FREE Shipping on all decal and sticker products | Free layout | A+ BBB rating | 24 years in the business | Call Today for a free quote on Removable Decals. You may be wondering what is so great about this temporary decal. Here are a few reasons why these decals can be used for so many things. 1. Removable decals have a special formulated adhesive that is not very sticky. These decals do stick well, but when it comes time to remove the decal, there is nothing else easier. The removable decals can be removed from any surface without leaving any adhesive behind and no scratching needed to try and get pieces of the sticky residue off the surface. 2. 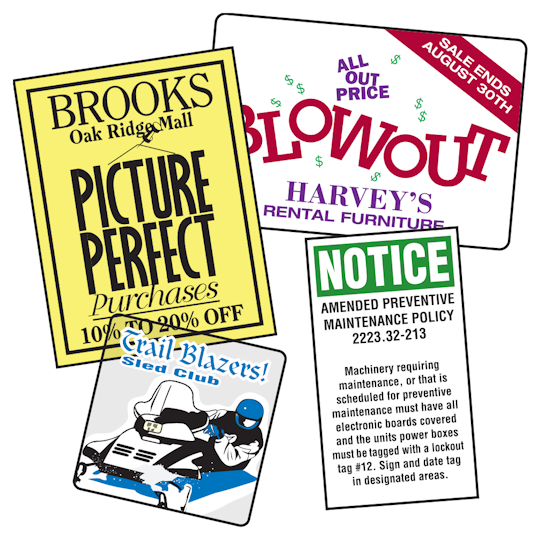 Removable decals are convenient and worry-free for those temporary announcements and advertising. Put up holiday hours on your store front glass door that can easily be removed when needed. Apply price ads to your TV screens in your electronics store. Who wants a sticky spot on their brand new reading or sun glasses? Small price decals are always convenient and even more enjoyable when they are easy to remove. Custom removable decals are great for all these reasons and will save your company and your customers time and stress. Many companies, small businesses, non profit organizations, schools and even court houses are just a few of who may find custom temporary removable personalized decals convenient. Electronics stores will find these decals convenient and cost efficient when they apply them to TVs, radios, games and movies, entertainment stands, computers, MP3 players, cell phones, and accessories. All companies can use personalized temporary decals on their store front windows and doors to announce sales and promotions. Once again, the great characteristic about these decals is that they can be removed with no problem. No sticky residue, no picking at the decal for hours with a razor blade. It’s easy and convenient as a decal can get. Custom removable decals may or may not be the product for you. To test these removable decals out, visit us on our contact us page and request a free sample. Free samples are given so you can be sure that what you are ordering is what you need. Do not, by any means, hesitate to request the free sample. Free quotes are also always available. To see what your custom removable decals will cost you, send in your ideas, lay out, and/or artwork and we will let you know what your next project will cost. Our company aims for outstanding customer service, so contact us today for information on your next projects ideas.